Most Israelis support Liberman’s joining the coalition, and there's only a small gap in favor of Ya'alon as Defense Minister. Most Israelis support Avigdor Liberman’s joining the coalition, a poll conducted for Channel 2 on Thursday evening found. The poll also found that there is a small gap of only 3% in favor of Moshe Ya’alon on the question of who the public believes is a better fit to serve as Defense Minister. This is different from an earlier Knesset Channel poll, which found that 52% of respondents said they prefer Ya’alon as Minister of Defense over 31% who said they prefer Liberman. Asked "who do you prefer as defense minister? 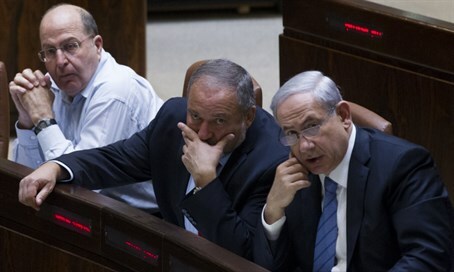 ", 38% of participants responded that they would prefer Ya'alon, while 35% said they would prefer Liberman. The second question in the poll was: "What kind of government do you prefer: a government headed by Netanyahu and the Zionist Union or a government headed by Netanyahu and Yisrael Beytenu?" To that question, only 24% of respondents said they preferred a unity government with Herzog, compared with 37% who would rather see Yisrael Beytenu joining Netanyahu's government. 32% of respondents said that they would not want either kind of government. The polls come as Liberman comes closer and closer to joining the coalition and being appointed Defense Minister in place of Ya’alon. Earlier on Thursday, Ya’alon spoke out about his likely successor, blasting his critics and making thinly veiled references to Netanyahu and the decision to hand over the Defense Ministry to Liberman. “The [leadership’s] moral compass has been lost regarding basic issues, issues that to me are quite obvious,” said Ya’alon, who hinted that Israel’s political leadership had abandoned good judgment in favor of short-term political gain. As for Ya’alon’s future in the government, reports suggested that he was offered the Foreign Ministry instead of the Defense Ministry, but his associates insisted on Wednesday that no such offer was made to him.